Even though kayaking is rising in popularity as a recreational sport, the problem lies in choosing the best fishing kayaks for your case. In this article, we will do a Malibu Kayaks review on one of the most famous model, the Malibu X-factor kayak. What Makes Malibu Kayaks Special? Among all kayak manufacturers, Malibu Kayaks is among one of the outstanding brands, with their kayaks being high quality. They have also been on the scene since 1999, with various people recommending them, including sports enthusiasts and anglers. 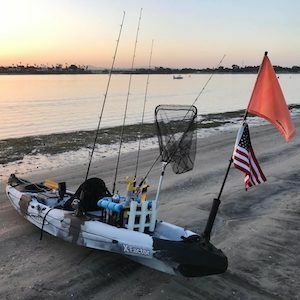 In addition, many anglers, recreational paddlers, surfers and scuba divers commend them to other users, and that leads to their current popularity and their status as the No.1 supplier of kayaks around the world. The manufacturer used two principles as the basis for the company - pursuing perfection in the quality of the product by avoiding the easy way out, and changing the norm through quality products and innovative thinking. The manufacturer makes these kayaks for the users in mind, designing them to have maximum levels of stability, durability and versatility. That means there is no need for awkward above deck rod holders, or aftermarket mounting systems for your electronics on board. Many specialized models are also within the kayak line, including the Mini X, Pro Explorer, X-Factor and Pro 2 Tandem. Malibu Kayaks started as a retailer of kayaks from other companies before making the gradual change to becoming a manufacturer of its own. This change was due to the recognition that every paddler has unique needs, mostly from interacting with users directly. The expertise of suppliers also factors in the design of the kayaks, resulting in kayaks having better designs, quality and performance. This is among the best boats in handling convenience and safety issues, and can help you to explore fishing largely, especially in bay, lake and river fishing. The boat performs best in calm fishing conditions, as well as comfortable diving into water, particularly in bay conditions. This is especially important because of the importance of keeping in mind the durability of kayaks in unpredictable water. Similar to many fishing kayaks, the build of the X-Factor comprises of polyethene, which is resistant to salt water and sunrays. This makes sure that the boat remains steady while the effects of weather on the boat itself are lower. The frame itself keeps the finish of the boat strong and smooth, improving the sailing quality overall. The fishing kayak itself is long, measuring 14-feet long - this makes it bigger than the industry average size. This creates three results - the speed the boat can develop is high, the boat gains stability as you sail, and the length removes the advantage of maneuvering present in shorter kayaks. This makes this specific kayak as not being a good unit for a complete beginner, and is better for someone that has more experience in fishing. The width itself conforms to the industry average, giving high stability even when moving through rough water. The boat has enough space that accommodates various build. In addition, the kayak is very good in both shallow and deep bay use because of its deep underwater keel measuring 13 inches. The boat itself is lightweight, weighing at 62 pounds - making it easy to heave and move with it. There are handles as well that help with portability, in addition to a side bungee handle. The boat has a wide cockpit area and a wide seat placement, which behaves as a standing platform. When you are sitting, you get an adjustable footrest similar to a pedal control. 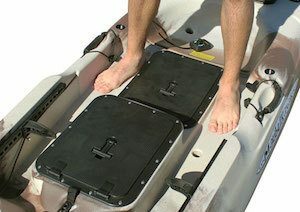 You also retain the ability to use the footrest and standing platform efficiently, as well as easier access to your storage parts of the boat, a feature similar to other Malibu Kayaks, according to reviews from users. The boat can withstand rough waves, thanks to the design of the bow that makes a high rocker. A stern comprising of rubber enhances mobility and stability of the kayak itself. The propulsion is of a superior quality than paddle-propelled units, and this makes it easy to move faster and improving your casting abilities. These two parts of the boat both have child-seating areas, with the stern area in the rear bungee storage, and the bow area above the gator hatch. The space allows you to place a child’s seat, so you can take your kids to a fishing trip. The storage capacity of the kayak will impress even the most demanding angler. The kayak has a maximum carrying capacity of 625 pounds, making it more than sufficient to carry various equipment. 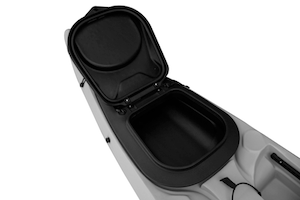 It makes the kayak carry a range of convenient tools, while allowing for easy propulsion. The cockpit of the kayak has a useful cup holder, which you can use to keep your drinks when you want them within easy reach. The X-factor kayak contains many storage parts. For instance, the center part has two rectangular hatches, which are large enough to change into mid-size coolers for fish. Keep in mind that the supplies that change the spaces into fish coolers cost more, mainly because you can use them to store things that kayakers want to get easily. The kayak is among the few boats that can accommodate divers, and this is mainly due to two dive tank wells that ensure the safety of your diving tanks in case you are a scuba diver. Other storage options include items such as ropes, bags and other tools. The bungee store area and gator hatch contain nylon eyelet straps that you can utilize to secure your materials and lower erratic movements, therefore keeping the stability of the boat high. There are self-draining trays that come with the package, and these work to lower chances of water puddles forming in the kayak, keeping it drier for longer. A drain plug at the end of the stern is present as well, and this drains away water that may seep into the inner parts of the kayak. All of this keeps the boat dry and comfortable, while keeping the fishing process effective. The X-Factor kayak has four rod-holders that are flush-mount, with two at the back and two at the front. This means that there are low chances of straining, especially when you try to attach the fishing spear and rod both prior and after use. If you would like to customize your rod hold, you can do so by buying a set of rod leashes. 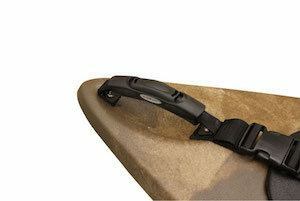 There is also a large paddle holder on the side of the boat, although you can also buy a paddle leash that increases the capability of the boat itself. With all these features, you would think the kayak is high-end in terms of price, but it remains an affordable option for you. You will struggle to get a similar offer anywhere else. You do not need to think about purchasing a new X-factor kayak for a long period after buying this one. The kayak has a limited lifetime warranty, making sure your kayak stays longer. The warranty also makes it good for fishing on a daily basis. The capacity of the boat is up to 625 pounds. You can handle and transport the kayak easily because of its multiple handles. All their kayaks, including the X-factor, have lifetime warranties, and they can assist you even when you encounter problems. You can get comfortable seats, even those that are separate from the kayak itself. Water may leak into the kayak because the hatch lid cover is not water tight. The kayak is slow when it lacks a motor because of its width. The X-factor kayak lacks its own set of seats. 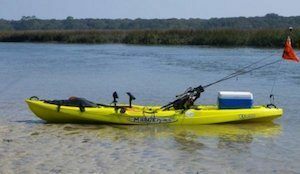 The range of models that you can get on the Malibu Kayaks accessories and series is wide, including the X-factor kayak. This magnificent kayak offers you great stability levels while remaining functional. The wide space the X-factor offers is very useful to anglers and divers alike, and the durability of the kayak itself is impressive. Among all fishing kayaks, we officially rate this one 4.7 stars out of 5. 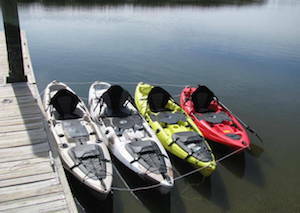 We hope you enjoyed our Malibu Kayaks review and that it will help you with your buying choice. As always, feel free to leave your comments and share your opinion with us in the comment section below.